Everyone else go home. This guy just won Halloween. When Todd Lipski lost his leg in a car accident in 2009, his entire life changed. But ever since that moment, Todd has refused to let the loss of his leg hold him back. So, this Halloween, he’s going all out in a really special way: Even though Todd only has one leg, for Halloween he’s dressing up as two beautiful, long legs. Life may have dealt Todd a hard blow, but just look at him now, strutting his stuff as a pair of disembodied legs. The incredible legs costume took him several weeks to make, but his hard work sure paid off. This Halloween, people won’t look at Todd and see a one-legged man trick-or-treating. 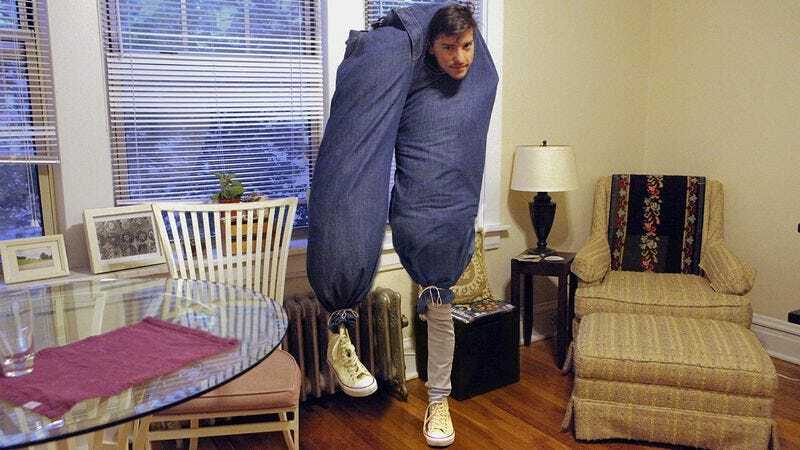 Instead, they’ll see TWO seemingly autonomous six-foot-long legs clothed in blue jeans going door-to-door in a powerful demonstration of the endurance of the human spirit. Now that’s pretty cool! Way to go, Todd. You look amazing, and it’s impossible not to be inspired by seeing you, a one-legged man, dressed up as two very nicely attired legs. Thanks for being awesome!